May 22nd, 2000 saw the official opening of the Glengarry Archives at the Sir John Johnson Manor House in Williamstown, Ontario. The Glengarry Archives has acquired the original land records which were previously kept at the Registry Office in Alexandria. The acquisition of Glengarry Church Records is proceeding well. The Glengarry Archives is administered by the Sir John Johnson Manor House Committee and is available/open to the public. Earle Sandilands died earlier this year in January 2007 age 80 of cancer. Along the banks of the Raisin River in the village of Williamstown can be found one of the oldest homes in Ontario. The five-bay Georgian style log house was built for Sir John Johnson between 1784-1792. The house, with its associated grist and saw mills, provided a focus for the community of United Empire Loyalists and later, for the fir traders of the North West Company. Sir John Johnson, only son of Sir William Johnson, inherited his father's large Mohawk Valley estates two years before the start of the American Revolutionary War (1776-1783). During the war Sir John organized and led the King's Royal Regiment of New York. As a result of his loyalties to the British Crown, all of his American, estates were confiscated. in compensation he was granted large land holdings in Canada, 2400 acres of which he chose in Charlottenburgh township. This location along the Raisin River (named in French for the grapes that grow along its banks) proved for saw and grist mill. Hence Williamstown, named after Sir Johns father, was born. In 1819, Sir John sold his Williamstown holdings to Hugh McGillis, a retired North West Company partner. Hugh, credited with having built the western addition to the original house, became the first "Lard of Williamstown." Several other partners of the Company retired to this area - establishing themselves as Highland gentlemen. Hugh's nephew John McGillis, inherited the property in 1848. The notaire John McGillis and his wife, Elizabeth Caldwell, lived at the house with a large family. They expanded the milling and agricultural operations and built the eastern Gothic addition of the 1860's. The social atmosphere of Williamstown and surrounding area was enhanced by subsequent owners. They included: Murdoch McLennan, a businessman, and farmer; his nephew Col. D. M. Robertson Q.C. ; and Mr. and Mrs. Lionel Devaux, thoroughbred horse breeders and trainers. Les Sours du Scare Coeur de Jesus bought the house from the Devaux family in 1956. The sisters resided and taught in the village until 1971. The Sir John Johnson House was declared a place of national historic significance in 1961 by the Historic Sites and Monuments Board of Canada. It was acquired by Parks Canada in 1971 and became part of a national system of parks and historic sites. Currently the east wing houses the Williamstown Library. The west wing is open to use by the public and is administered by the Sir John Johnson Manor House Committee. The West wing houses the Glengarry Archives, land and church records from Glengarry's earliest days. This pamphlet was produced under a program funded by the Government of Canada under the authority of Human Resources Development Canada. Sir John Johnson "In February of 1784, Sir John had asked permission from Governor Haldimand to go up to the lands reserved for settlement by his corps"
""and chose a place for myself and set some of my own servants to work, which I flatter myself will be an encouragement to some of my followers... I mean immediately to make a beginning""
Sir John Johnson was born on November 5, 1742, in the Mohawk Valley New York. Sir John and his wife Lady Mary "Polly" Watts and family were residing in Montreal at the close of the American Revolutionary War. He was appointed Superintendent General of Indian Affairs for British North America in 1783, and asked by Governor Haldimand to take charge of the allocation of land to the Loyalist veterans and refugees in Upper Canada. In 1791 Sir John was narrowly overlooked for the post of Lieutenant- Governor of Upper Canada in favor of John Graves Simcoe. As a result, Sir John spent most of his time, in Lower Canada. 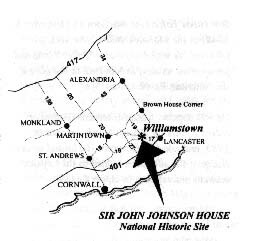 it is likely that Sir John did visit Williamstown to supervise his land holdings and his mills. It is known that he took some interest in the area, as in 1814 he presented twelve acres of land for the purpose of a fairground to the people of the district. This property is still used today for the "Williamstown Fair," the oldest county fair in Ontario. "I have as many visits and calls as if I were Sir John. But the greater part of these calls are interested: for I find I am thought to be possessed of a mountain of gold"
Hugh, McGillis donated the land upon which St. Mary's Church, is erected and built the red brick house across the street for his maiden niece Mary. Upon his death Hugh bequeathed his Williamstown estates to his nephew John McGillis who became the second Laird of Williamstown. Under the McGillis ownership the former Johnson estates became a sizable milling and agricultural operation. By 1861 McGillis had cultivated 180 acres of land which he used for mixed farming. He also employed a total of eight men in his mills. The farm sustained his large family, with enough, left over to make a sizable profit at the end of the year. Murdoch McLennan bought the house in 1872, adding to his already large landholdings in the area. The bachelor "Murdie" was a successful businessman and farmer. He operated the farmstead but likely leased out the saw and grist Miffs. Murdoch, upon his death on March 6, 1897, transferred the properties to his nephew Col. Donald Murdoch Robertson . extensively in animal husbandry and field agriculture. 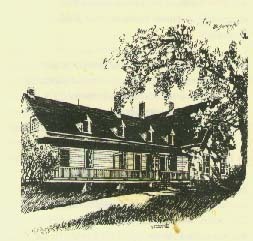 In 1938 the Manor House and farmlands were sold to Lionel A. Devaux , a retired Montreal businessman. Devaux raised and trained thoroughbred race horses in the stables which were destroyed by fire in 1954. In 1956 the Devaux family sold the house and lands to Les Soeurs du Sacre, Coeur de Jesus. The sisters were a teaching order which taught at Ste. Alice School in Williamstown. The sisters sold the agricultural lands in 1965, but maintained ownership of the Manor House until 1971.